This is ManyTracks’ first time out as a theater company. Its mission is “Many Different Tracks to Making Theatre,” and suggests not only a creative openness as far as the type or genre of work we are interested in—be it straight theater, musical theatre, solo performances, dance or a mix—but also pertains to our interest in exploring different ways on how theatre pieces are conceived (e.g., our first project, The Man in the Newspaper Hat by Hayley Heaton, which draws its inspiration from a non-narrative poem by Elizabeth Bishop, “Visits to St.Elizabeths”). When it comes to selecting material, ManyTracks has no political agenda, no beliefs other than the steadfast conviction that it’s the questions that matter, not the answers. Rather than taking sides, ManyTracks is interested in pursuing projects which focus on presenting these conundrums that make our world. There is no objective truth; the world is bigger than any one mind, one party line, gender, race, passion. It’s the kaleidoscope of dizzying “truths” and ways of doing things that make our world, and ManyTracks is passionately in favor of seeing its audience talk, argue, think, open up its imagination to new ways of looking at things. If one result is confusion, ManyTracks believes this to be closer to the truth than message. ManyTracks is interested in collaborating with other companies to pool both their creative resources and also their organizational necessities. In times as these we need to be creative about how we go about making art! Children), Cpt. Bluntchli (Arms and the Man), Prof. Serebriakov (Uncle Vanya), Thomas Dunne (Steward of Christendom), The Duke (Big River), Mr Peachum (The Threepenny Opera), Henry (The Real Thing) and Harpagon (The Miser). His wife Stephanie and children James and Jennifer are also in theatre. www.angushepburn.com. Anne Fizzard (Elizabeth Bishop) is a producing director of the WorkShop Theater Company in New York. There, she has played Freida in The Bow-Wow Club by Levy Lee Simon and Eileen in Moonlight and Love Songs by Scott C. Sickles and appeared in numerous one-acts and readings; she has done ensemble work in the Women’s Project and Productions Directors Forum, and played Zatime in Racine’s Bajazet, in the original French (CUNY). Hayley Heaton (playwright) was educated at the University of Utah, as well as Cambridge University where she spent a brief stint studying various sonnets. She received her M.F.A. in creative writing from The New School in 2007. Heaton is currently working on two new plays, a collection of ekphrastic poetry, a series of comic books and a classified endeavor involving luxury hotel rooms. Productions (www.turtleshellproductions.com), one of which is Hayley Heaton’s surreal comedy Liteo-Game. Katrin is an alumna of the Directors Lab West of 2007, a member of the Jewish Theater of New York and of the WorkShop Theater Company. She holds a master’s degree in philosophy, musicology and English/American literature from the University of Berne (Switzerland) and is both a citizen of the USA and the Principality of Liechtenstein, where she grew up. Katrin is the founder and artistic director of ManyTracks. Please see www.katrinhilbe.com and www.manytracks.org. Arienne Pelletier (stage manager/associate producer). Highlights as stage manager include Three Sisters (Theatre of the Expendable), The October Crisis (FringeNYC 2008), Beebo Brinker Chronicles (Hourglass Group), The Dinner Party (Target Margin Theater), The Silent Concerto (Packawallop Productions), Tuesdays with Morrie (national tour), The Constant Wife (Coconut Grove Playhouse) and After Ashley (Humana Festival at Actor’s Theatre of Louisville). Arienne was an associate producer with terraNOVA Collective on Blue Before Morning and currently is a staff producer with Theatre of the Expendable. Oliver Conant (dramaturg) studied English and comparative literature at Columbia University. 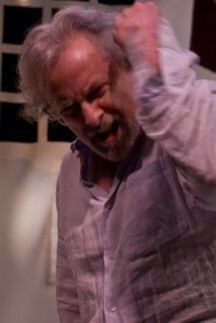 A New York-based actor, writer and sometime director, he is a member of Nicu’s Spoon, Judith Shakespeare Company and Medicine Show Theater. Since the early 1980s Oliver’s essays and reviews have appeared in such redoubts of the printed word as Bookforum, the New York Times Book Review, The Common Review, The American Book Review and Dissent. Elisha Schaefer (set designer). Originally from Santa Barbara, CA, Elisha holds a B.A. in theater from Vassar College and completed the spring at Tisch program at NYU. In New York, favorite projects include The Wedding Play (14th St. Theater), Anchors and Nate and Bette (Theatre Row), If Wishes Were Horses (Altered Stages), River’s End (NYMF), Purple Hearts (Gene Frankel) and Questa and Cowboys! (Wings Theatre). He has also designed for NYU Tisch, NYU Grad Film, Greenville HS and Grace Church School. Recent projects include The Road to Washington (The Mountain Playhouse), A Taste of Honey (Cherry Lane Studio) and Lysistrata (Greek Cultural Center). When he’s not designing, Elisha can be found building sets at the Public Theater or photographing productions Off Broadway. Town, T. Schreiber Studio, Playhouse on the Green and St. Bart’s Players. She is a frequent designer for Princeton University and was nominated for a 2006 NY IT Award (Outstanding Costume Design) for They’re Just Like Us. Upcoming: Bus Stop (The Gallery Players). M.F.A., Ohio University. www.meredithneal.net. Pocket Change (currently playing as part of the Short Attention Span festival at the Players Theatre Loft) and Charlie Chang and the Mysterious Salami, which won the award for “worst musical” as part of NY Artists Unlimited’s Bad Musicals Festival. For more information, contact him at www.andycomusic.com. Joan Racho-Jansen (lighting designer) is currently the resident lighting designer at the Michael Chekhov Theatre Company. Joan has worked as an itinerant decorateur de l’allumage in rock and roll, downtown dance, musical comedy, experimental drama, classical productions and original pieces of value. Production photos by Jill Steinberg and Elisha Schaefer. Inspired by Elizabeth Bishop’s poem “Visits to St. Elizabeths,” Hayley Heaton’s The Man in the Newspaper Hat consists of a series of meetings between the poets Ezra Pound and Elizabeth Bishop between 1949 and 1950 at the hospital of St. Elizabeths in Washington DC. Pound was confined there after having been declared mentally unfit to stand trial for high treason for his broadcasts over Rome Radio during the Second World War. At the time our play takes place Bishop has been appointed consultant in poetry at the Library of Congress, a position comparable to the current one of poet laureate. They talk about what makes a good poem, but there is no escaping controversy. Was he mad? A traitor? Or a literary genius deluded? The Man in the Newspaper Hat does not attempt to be a biographical piece documenting the actual encounters between Pound and Bishop, but dramatizesa series of imagined meetings between two artists who are not only polar opposites in poetics and politics, but are also very different personalities. Where Pound was undoubtedly highly egocentric and grandiose, convinced of possessing the key to world peace and very sure of his position in the world of literature, Bishop was painfully unsure of her place in the world. She wrote slowly, rewrote her poems again and again—sometimes for up to twenty years. She suffered all her life from self-doubt, even self-hatred, struggled with alcoholism and the difficulties of being a lesbian in a conservative time. Pound, on the other hand, was convinced of his genius, prolific and had no qualms about openly maintaining a wife and a mistress. history rather than a political conundrum? In the end Bishop goes away and writes the poem “Visits to St. Elizabeths” (1950), a strange, critical, almost cruel commentary on Pound in the form of a nursery rhyme. Man is not a typical “director’s piece,” as it is very clearly character-driven, and my job has been about creating an environment where the complexities of the persons and the script can be explored in a real and imaginative way. Being the producer and the director ensures that the best possible cast and crew the project at hand could want is actually assembled, that the structure is taken care of so that this very odd couple can live the journey that you are about to share.